If we did a key word search through our posts I’m guessing a popular phrase would be “good thing we’re flexible”. That holds true for this week, too. 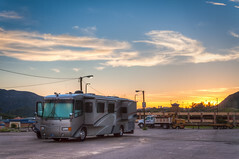 We had intended to stay at Chula Vista RV Park for the month of March. When we found out we’d have to move locations (due to maintenance on our site) the gypsy blood started flowing and we figured once we pack everything up we might as well head on down the road. With only a couple days to figure things out, we quickly pulled together a plan that includes two nights casino camping at the Sycuan Casino before our spot at Santee Lakes is available. Sitting in a parking lot isn’t glamorous by any stretch of the imagination, but when we’re inside the RV we can imagine that we’re anywhere in the world on the outside. Mother Nature was kind enough to give us warm weather and gorgeous sunsets to enjoy as well, so the experience flies by quickly and we’ll be back on the road in no time.